Another weekly Golden Age Constructed Event. I decided to try something new – pushing ‘Unblockable when attacking alone’ as hard as I could. It may not look that impressive at first glance, but think about what happens if you buff Kitty Pryde’s attack to 5A, then field two Mary Marvel dice. 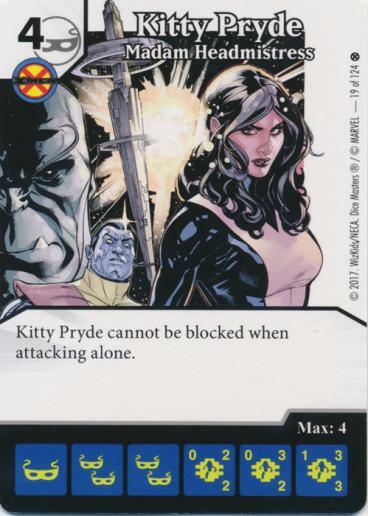 If you target Kitty Pryde both times her attack doubles to 10 and then doubles again to 20. An unblockable 20A character is quite the threat. Of course, there’s a simpler way to get Mary’s effect to fire twice on a given turn than buying two 6-cost characters and drawing and rolling them on the same turn. Some of you are probably thinking Rare Absorbing Man, but he’s one of the gaps in my collection, so I made do with his precursor, common Adam Warlock. So what else does the team need? First, at least one attack buff global. Kitty Pryde has an A of 2-3-3 so it’s going to take at least two energy to get her to 5A. I opted to include both a fist and a bolt stat buff global to give me flexibility. For the fist, I went with common Hulk from Thor. 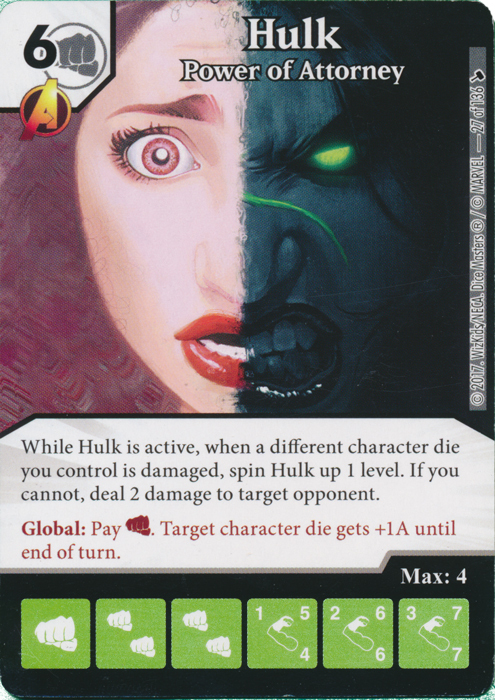 The only fist pump globals in Modern are on Hulk cards. I went with the common because it gives me an alternate win condition, and as a known commodity, may occupy my opponent’s attention when they see it across the table. I went with Excessive Force for the bolt pump global over Raised Shields. The former will be less problematic if my opponent decides to buy it. Next came Wonder Woman – Child of Clay. If necessary, she can prevent Kitty Pryde from being targeted by Static Field or somebody else with a force attack global. After that came Shriek. If Kitty, Mary, or Adam are Shrieked or Blobbed I wanted something to potentially shake them loose. Now the three dice my plan requires me to buy cost 4, 5 and 6 so a cost reduction global would come in handy. I went with the blank Kree Captain, because I have no other Villains on the team, and he only costs 2 so is a source of potential fists for globals – both his own and Hulk. 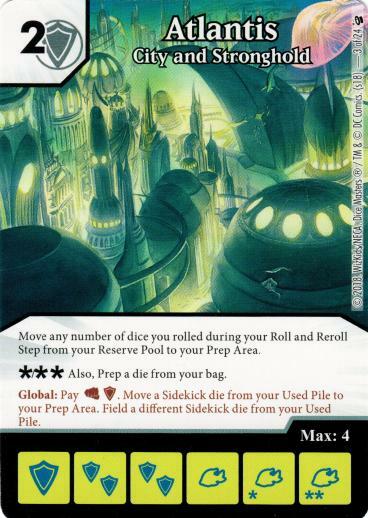 For my eighth card, I decided to go with Atlantis – City and Stronghold. It gives me a couple of sources of ramp – the global and the action. For my second BAC, I went with the new Stretch, mostly out of curiosity. There’s the team. How did it work? Golden Age PXG, Morphing Jars, Larfleeze, the Onslaught that becomes unblockable when awakened, and the new global Clayface. He also had the Mr. Mxyzptlk that turns one die into a copy of another. His plan was to do his damage with either Onslaught or Clayface, using Mr. Mxyzptlk to create extra copies of them. He went for Onslaught first, and between Morphing Jars and PXG, got a couple into circulation fairly quickly. I bought an Atlantis die, then Adam Warlock, Mary Marvel, and finally Kitty Pryde. It took a while for everything to line up – my characters, especially Mary Marvel didn’t seem to want to roll character faces. Fortunately for me, especially since he’d gotten a Clayface die into circulation, my opponent’s dice weren’t being any more cooperative for him. Eventually, I had Kitty and Adam Warlock in the field and managed to land Mary Marvel on a character face. I had enough energy to buff Kitty to 6A and then field Mary, which gave me the win. The new Strike versions of Aquaman and Black Canary, the Gorilla Grodd with Strike and Overcrush, SR Maletkith so he can get his Strike characters out of his field, and the other version of Atlantis with the global. He also Madame Masque, but he mistakenly brought the Common, rather than the Uncommon he’d intended to bring. The Uncommon is the one that suppresses “When fielded” abilities. So either that worked to my advantage, or we saved a little time because I didn’t have to buy my Shriek to use on his Madame Masque. I managed to buy Adam Warlock on Turn 2, and he came out on his Level 3 face quite early. As the only non-Sidekick die in the field for the next several turns, he was a frequent target for Thrown Bricks. He managed to hit me for 4 damage with a Strike Aquaman by buffing his A 4 times, but that was the exception. 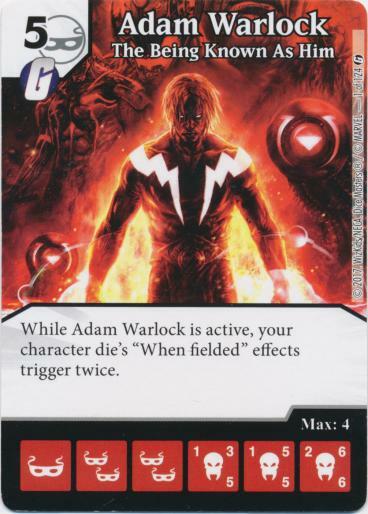 With a 6-6 Adam Warlock in my field, his JL Strike characters weren’t real threats unless they were heavily buffed, and he wasn’t able to do that on a regular basis. Not to mention, he was also having some problems rolling character faces. I got a Kitty Pryde die into my field to go with the Adam Warlock, but Mary Marvel stayed energy the first time around, so I bought my second Mary Marvel die. They ended up coming out of the bag together, and after the re-roll one was on a character face, and the other was a double bolt, which helped with the attack buffs. There was enough other energy to pay fielding costs, and complete buffing Kitty Pryde to 6A. So I buffed Kitty and fielded Mary for the win. Foetid Bloat-Drone with Deadly that forces all opposing characters to block him. Noxious Blightbringer that pings opponents whenever they spend a ‘?’ combined with Golden Age PXG. And Rare Gelatinous Cube from Faerun Under Siege. Add to that Hypervelocity. I bought Kitty Pryde and Adam Warlock while he went for Bloat-Drone and Blightbringer. On the critical turn, he captured the only Kitty Pryde die I’d bought. I had four masks in my field, two on Sidekick dice and the Kitty Pryde die on a double mask side. I had my other six Sidekick dice in my Used Pile. I used the Sidekick masks and one from the Kitty Pryde die to prep six Sidekick dice with the PXG global. I paused for a moment, because I knew that prepping my last two Sidekick dice would result in me taking two points of bag burn, but after a moment’s reflection, I decided to do it. My inattention there guaranteed either the Mary Marvel die or the Kitty Pryde die would be captured. Even if I just hadn’t used PXG the final time, my Kitty Pryde die would have been in my Reserve Pool on an energy face and I’d have had two Sidekick dice in my Used Pile when he fielded Gelatinous Cube and triggered a bag refill. If he’d captured the Mary Marvel die at that point it would have put the same kind of crimp in my plans, but if I hadn’t used PXG the final time the odds were 2-1 the die he captured would have been a Sidekick die. Even with Foetid Bloat-Drone wiping my field each turn, I did manage to roll a Kitty Pryde, an Adam Warlock and a Mary Marvel on the same turn. Problem was the latter two both had fielding costs of 2, and I didn’t have the energy to field them both and buff Kitty Pryde’s A up to 5 before fielding Mary Marvel. My opponent was able to build up a wall, even if it was mostly Sidekicks and Poxwalkers. Hampered by his Bloat-Drone attacks, and, to a lesser degree, by the Hypervelocity he’d put in play, I couldn’t match him. I was also being weakened by damage from Blightbringer since there were occasions I needed to spend the energy more than I needed to avoid the damage. The combination meant he was eventually able to overwhelm me. The Mary/Kitty/Adam combination worked pretty much as I expected. Nobody was getting great rolls in either of my first two games, but I managed to pull them out. Round 3, if I’m a little more cagey and avoid getting either my Mary Marvel die or my Kitty Pryde die captured I had an excellent chance to win on the next turn. The problem there was the pilot, not the team. Besides the Adam/Kitty/Mary trio, the only other die I bought all night was an Atlantis die. I didn’t find it very useful, but I think that might be in large part because two of my opponents were running Golden Age PXG. That made it somewhat redundant. In the right situation, I think it might be a very useful action, I’m just not sure how good a fit it is on this team. What other character cards do you think would work well with this Mary Marvel? Let us know in the comments. Thanks for the suggestion, @Green Lantern. We’re always happy to hear from our readers. I’m not saying Batman: Plays Too Rough is a bad choice, but it may not be as good as you thought. The increase to Batman’s A and D from each Sidekick in the field would NOT be increased by Mary Marvel’s “When fielded” ability. The buff Batman receives from Sidekicks is a result of his own card text, and is therefore what is known as a ‘static effect’ in the Dice Masters Rules Forum. There have been multiple rulings in the forum that essentially say static effects cannot be changed by the actions of players. If a player has a Level 2 Batman in the field (5A, 5D) when each side has two Sidekicks in the Field Zone, Batman would be a 9A, 9D character. If that player then fields a Mary Marvel, the buff from Sidekicks is exempt from the doubling, so Batman becomes 10A, 10D before considering his ability and 14A, 14D once his ability and the 4 total Sidekicks in this example are factored back in. ‘Static effect’ vs non-static (also known as ‘applied’) effect isn’t the easiest thing to understand, I will grant you. It might help to think of it like this – Static effects take place (more specifically, ARE taking place) because of the current game state (in the example because Batman is active). Applied effects are in place because of history- the energy cost for a global was paid, an action die was used, a character such as Mary Marvel or Black Widow: The Widow’s Bite was fielded. 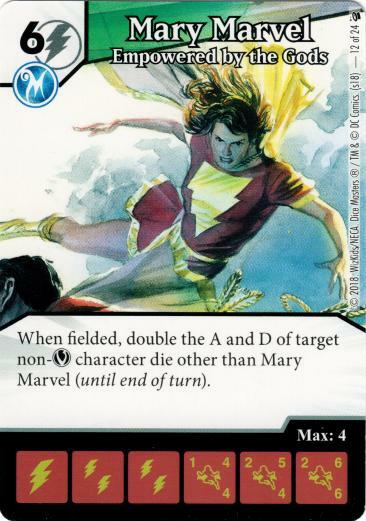 It’s something that’s very easy to mess up when you start combining cards like Mary Marvel: Empowered by the Gods and Batman: Plays Too Rough so I thought I’d put out a word of warning for all our readers (or at least the ones who read the comments).